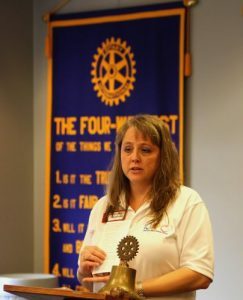 Chatham Rotary Club’s program this week at the Community Center featured Kimberly Baldridge, Executive Director of the Danville-Pittsylvania Cancer Association (DPC.) Rotarian Carol Motley introduced Kim, who provided an interesting and informative program to raise awareness of this important organization. DPC is a non-profit organization located in Danville, but with a mission of serving Cancer Patients in Danville and the county. 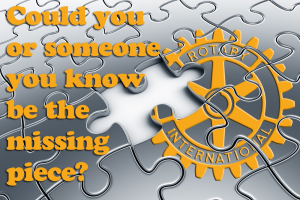 Kim introduced the organization that many members of Rotary were not aware of, and discussed their mission and support in the Danville and Pittsylvania County area. Kim emphasized that DPC focuses on assisting area residents defray many of the expensive services involved in active cancer treatment. Eligible expenses include Cancer-Related prescriptions, treatment supplies, transportation to medical appointments and treatments, medical equipment, nutritional supplements, prosthesis and special needs, and other necessities of life relating to cancer. Kim emphasized that DPC does not charge clients for any services. DPC is community funded through local grants and are also funded by many local fundraisers such as Bridge to Bridge, which next year will be the eighth one and is scheduled for April 14, 2018. Another local fundraiser is the Return to the Coke Plant, which will take place on October 7, 2017 and also the 8th Annual Dean Ferris Memorial Ride, which will take place this weekend on August 19, 2017. Many other local fund raisers take place and information is available on their website. Paul Nicholson, Club President, and Robert Wickboldt, Membership Committee Chairman for the Club, brought members up-to-date on the next week’s Membership Social to be held at Reid Street Gallery, August 22nd, at 6:30 pm with both club members and guests who are potential members of Chatham Rotary attending. 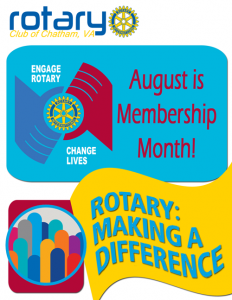 The social meeting will feature an overview of the Chatham Rotary Club and the mission of Rotary to support both local activities and organizations and International Rotary contributions. Members are encouraged to invite any potential members and their spouses to this informative and enjoyable evening. Refreshments and food will be provided for all. The normal weekly noon meeting will be replaced by this social.